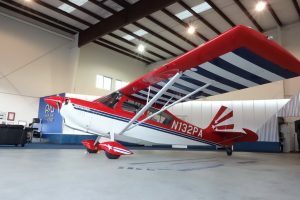 If you’ve ever watched an aerobatic airplane dance around in an airshow or wondered what a roller coaster without tracks would feel like, this Thrill Ride will take you there! Once you’re at the controls of this Super Decathlon you’ll be able to literally make your way through almost every one of those aerobatic maneuvers yourself while at the controls getting direct guidance by your instructor. Experience loops, rolls, hammerheads, spins, and more all while flying along the beautiful coastline around the south side of the Palos Verdes peninsula. You can make it super tame and still fly along all the beautiful coastal sites, or pick and choose every maneuver to push the limits of this easy to fly aerobatic airplane. Bring your Go-Pro camera and we’ll help you document the whole flight!